Corner Motor Sales Ltd. was established in the late 1940’s by brothers George S. Corner and Ray Corner in Delhi, Ontario. Beginning as a garage and gas station, the company soon evolved with the manufacture and distribution of diesel engines and supplies for the booming irrigation trade in Southern Ontario.The distribution of Murphy Swichgauges through Corner Motor Sales Ltd. began in the early 1950’s when George agreed with representatives from F.W. Murphy in the U.S. to handle their product in Canada. 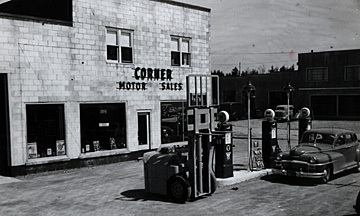 Murray Corner, George’s son, joined Corner Motor Sales Ltd. in 1950 and helped direct the company further in the expanding Industrial Engine business along with increasing distribution of Murphy Swichgauges into the province of Quebec. As Corner Motor Sales Ltd. evolved over the years the company slowly got away from the irrigation and industrial engine side of the business and concentrated solely on the distribution of Murphy Swichgauges. Murray Corner along with his wife Merle operated the company together until 1994 when Murray passed away. Merle Corner continued to operate Corner Motor Sales Ltd. until she retired in 1998, at which time her son Dale Corner began operating the business and continues to today.